Jesus was kaarana-janma, a Master born with a purpose, the mission of restoring love, charity and compassion in the heart of man. He had no attachment to the self, nor paid any heed to joy or sorrow, loss or gain. He had a heart that responded to the call of anguish, and he went about the land preaching the lesson of love. His life was a libation for the upliftment of humanity. Like most seekers, he first searched for the Divine · in the objective world. But he soon realised that the world is a kaleidoscopic picture created by one’s own imagination, and sought to find God within himself. His stay in the Himaalayan monasteries in Kashmir and in other centres of eastern asceticism and philosophical inquiry, gave him greater awareness. From the attitude of being a Messenger of God, he could now call himself the Son of Clod. The bond of relationship increased: the ‘I’ was no more some distant light or entity; the light became a part of the “I.” With the body-consciousness predominant, he was a messenger. With the heart-consciousness in the ascendant, he-felt a greater nearness and dearness, and so the son-father bond seems natural at this stage. 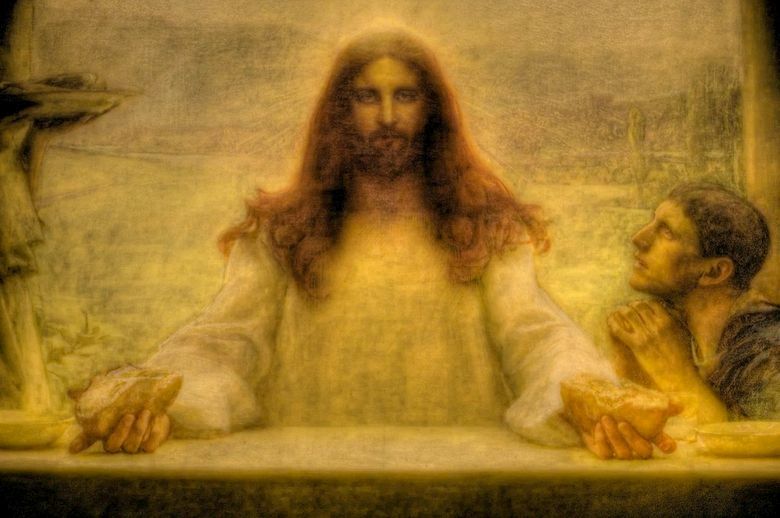 Later as the Aathman-consciousness was established, Jesus could declare, “I and My Father are One.” The three stages may be described as: “I was in the Light,” “The Light was in me,” and “I am the light,” and may be compared to the Dhwaitha (dualism), Visishtaadhwaitha (qualified non-dualism) and Adhwaitha (non-dualism) stages as described in Vedhic philosophy. The final stage is the one when all duality has been shed. This is the essence of all religious disciplines and teachings. Jesus was honoured by the populace as Christ, for they found in his thoughts, words and deeds, no trace of ego. He had no envy or hatred, and was full of love and charity, humility and sympathy. 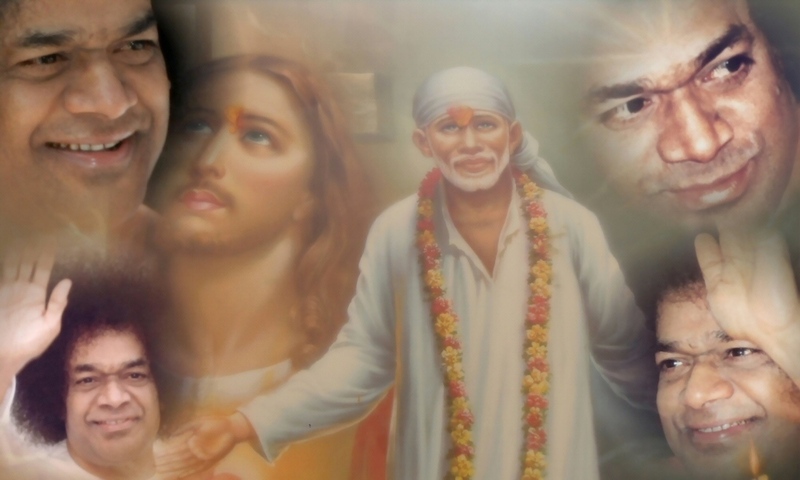 Jesus’ original name was Isa which, when repeated, is Sai. 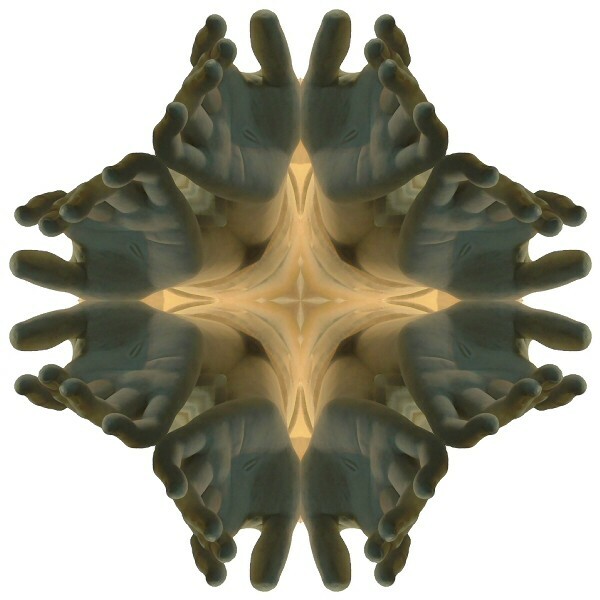 Isa and Sai, both mean Ishwara (God), the Eternal Absolute, the Sath-Chith-Aanandha (Being-Awareness-Bliss). In the Tibetan manuscript, at the monastery where Isa spent some years, his name is written as Isha, which means the Lord of all living beings. Karim Sab, (67) shriveled and taciturn, sits every evening on the cuddapah black-stone bench in front of his dormitory. His posture denotes uncertainty, even loneliness, like an autumn-leaf about to be wind-blown; and he waits there till the sunlight turns yellow and makes dull the hills around him. The mid-November mist fills the somnolent air in Anantapur with a chilled invisibility. As an inmate of the Home for the Aged in this Andhra town, Karim Sab’s life is uneventful. Nothing remarkable has come his way except that he has been a classmate of the one whom he calls “Sathya” — and whom the world now knows as Sathya Sai Baba. Karim Sab informs this author that he has known BABA in the primary school, six decades ago. Delight ripples over his tired features as he recalls those happy days. His simple faith in Allah rules out questions about the ways of divinity. Calling these experiences as “jewels in the heart” he feels grateful and is content for the chance he has had. 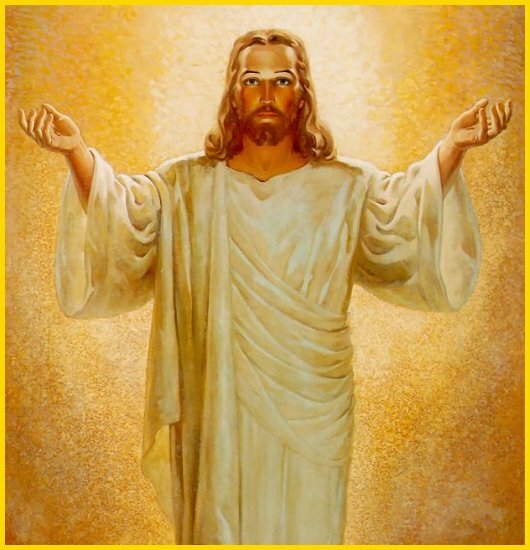 As an update to the former article entitled Jesus Photos – Sathya Sai Baba Crucifix – Sketches, Art, Pictures Of Jesus Christ, this blogged post will look at alternative artistic depictions of Jesus Christ. 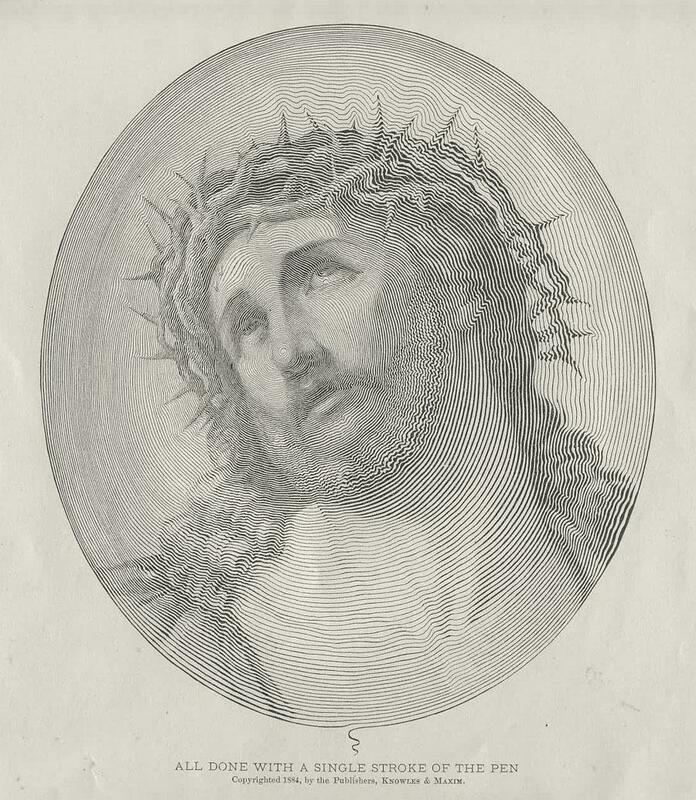 The race of Jesus has been a subject of debate since at least the 19th century. 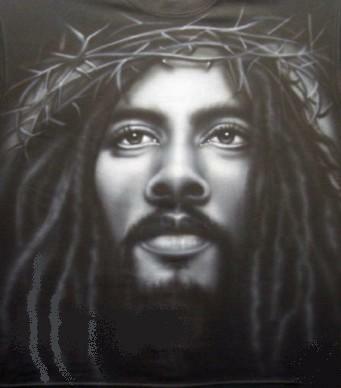 The physical appearance of Jesus of Nazareth was debated by theologians from early on in the history of Christianity, though with no explicit emphasis on race. 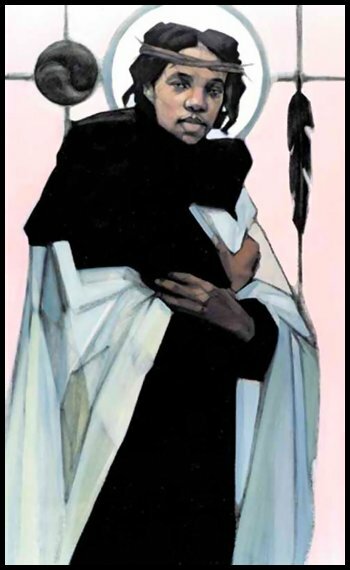 Not all depictions of Jesus are intended to literally represent how he is thought to have looked; many such representations are largely symbolic, spiritual, and personal, and the race chosen may be intended only to reflect, or more recently to contradict, local expectations. This may be true of both pictorial and cinematic portrayals. “An English couple went to Puttaparthi (Sathya Sai Baba‘s place of residence in India). The husband had faith in Baba but the wife believed in Jesus Christ. Baba called them in for an interview. The husband had an automatic camera which started clicking by itself during the interview. 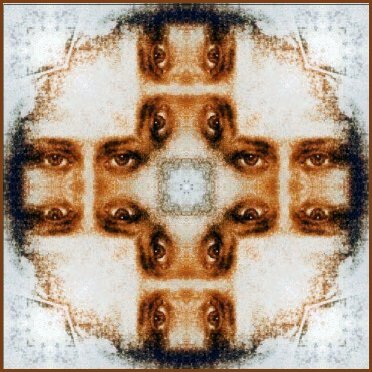 When the couple went back to England and had the film developed, they got this picture of the face of Jesus. We may also know the Avathar by the sixteen signs that accompany him: creation, preservation, dissolution, knowledge of incarnations, special Grace and the power to bestow it; each of these in the past, present, and future, thus totaling fifteen, with the sixteenth being Paramathma, the Divine, resident in the heart of each being. To these sixteen signs of the divine incarnation of the Avathar, Baba adds another sign, which he terms the most significant of all –divine love, universal and impersonal, yet personal. The lingam has been seen by the writer a number of times. On the occasion of one Mahasivaratri night, I was sitting quite close to Sai Baba. When the moment came, I saw a flash of gold come from his mouth and saw the lingam caught in the silk handkerchief held by his hands. It was of gold. How an object that size came up Sri Baba’s throat cannot be explained. At another Mahasivaratri, the lingam was translucent, and there was a clearly visible flame in the center of the lingam. The evening before the Mahasivaratri Day of 1973, we were told to be ready in the early morning for a trip; and that when the cars were loaded and ready, we would know the destination. Swami had decided that only a handful of people would be with him when the lingam became manifest. Our destination was the Bandipur Game Sanctuary in Bandipur Forest, several hours away in Mysore State. We arrived at the Forest resthouse in the early afternoon. The next morning, we returned to our cars and, guided by the Forest people, took various winding roads, hoping to come upon one of the Forest’s wild elephant herds. As we moved through the trees and the open areas, in our minds we were hoping for a replay of the dramatic and fascinating encounter between Satya Sai Baba and a wild elephant herd which had taken place some years before when Swami and some devotees had made a holiday expedition to the Game Sanctuary. This time, however, the elephants remained in their secret places and not even one was seen. But the drive through the hills had another and more important objective. Swami intended to find a correct site where we could gather at dusk for the sacred event of the lingam birth. It was on this great and most mysterious occasion, unknown and beyond imagination to the world at large, that the crucifix came into being. “Well, Swami, it is a cross,” I answered. Baba then closed his fingers over the twigs and directed three somewhat slow breaths into his fist, between thumb and forefinger. 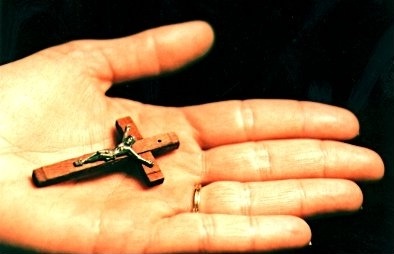 Then he opened his hand to reveal a Christ figure crucified on a cross, and he gave it to me. I noticed something odd and asked, “Swami, what is that hole at the top of the cross?” Baba replied that the cross had been originally hung from a standard. We continued down to the river bed, and Baba seated us in a rectangle, with himself at the head. 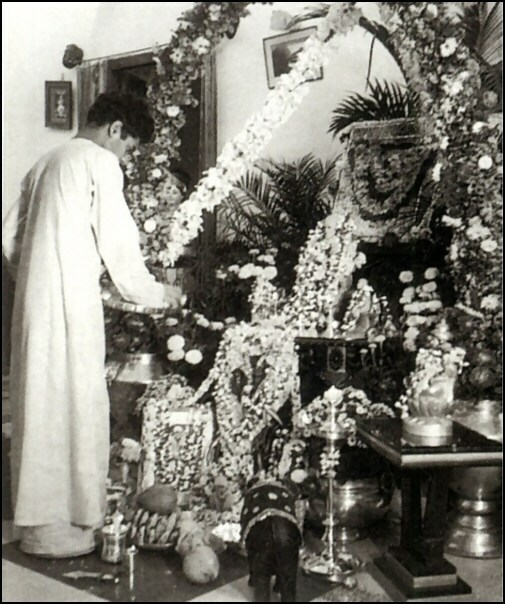 It could be seen that Swami’s body was already in labor, and the group at once started singing bhajans (sacred songs of devotion and praise to Divinity). This continued without interruption until the lingam came out from Baba’s throat and was caught by him in a silk handkerchief. After the lingam had been admired by everyone, Swami put it aside. He then raised a small heap of sand in front of his knees, and with his finger sketched an outline on it. Then in a moment or two, he dug his hand into the sand and brought forth a silver flask filled with amrith. Then he moved his hand and created a small silver cup. Everyone, from his hand, was then given a portion of the amrith, nectar of the Gods. How delicate and delicious was the taste! It is unique. There is no other taste to compare it to. Within a few weeks we were back at our home in Mexico and were soon to witness an amazing series of events in relation to the crucifix. The cross is so small that the details on the figure of Christ escape the eye. 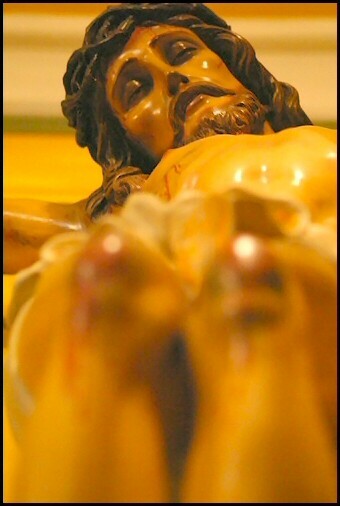 A friend, Walter, came down to our home and took some color photographs of the crucifix. The over-all length of the Christ figure is only one inch, and Walter was to make some enlargements to bring out the detail. When he mailed us a sample of the prints, my wife and I were astounded. I wrote to him and said that if the pictures were seen around the world, they would create an art sensation. I am sure it is the greatest sculpture of Christ ever made. In my estimation, it is the most extraordinary object Sri Sathya Sai has ever created for the joy of his devotees. A few weeks later, Walter and his wife returned with color enlargements of the cross. These, along with the actual cross, were spread out on the dining room table, next to large french windows overlooking the sea. The time was about 5 p.m. 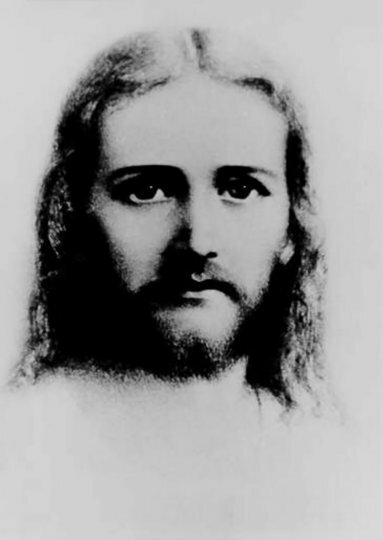 The details revealed by the photographic enlargements were so extraordinary that all persons present were concentrating on this amazing vision of Christ, and on the mystery and wonder of Sri Bhagavan. On this afternoon, the sky along the Mexican coast was clear and peaceful. But suddenly, without any warning, there was a loud crash of thunder, and as our eyes turned to the windows, lightning flashed from a dark cloud where a moment before there had been only clear sky. A violent wind rushed through the house, causing windows and doors to open and shut with such force that glass was in danger of shattering. The curtains were flying in all directions. We were much startled by this turn of events, but my wife at once said, “It is 5 p.m., the time Christ died on the cross, and what is now happening is described in the Bible.” She later brought a Bible and we looked until we found the pertinent paragraph, which said that at the moment Christ gave up His life, a violent storm arose with lightning and thunder, and winds rent the curtains of the temple. We concluded that we had witnessed a wonder totally beyond our power of imagination. Before our eyes had occured nothing less than a recapitulation of events related to the crucifixion. The following day newspapers in San Diego carried a brief story commenting on the sudden and mysterious storm that had arisen without warning on the Mexican coast, near Ensenada. We and our friends concluded that this recapitulation of an event which had taken place some 2,000 years ago upon the crucifixion of Christ implied a great power connected in some way with that small cross and Christ figure materialized by Baba. A year or so later, I sent a description of the event to Dr. Eruch B. Fanibunda for his book, Vision of the Divine. He showed the memo to Baba. After reading the memo, Baba said that the event occurred as described and that the significance attributed to it was correct. Further information and assistance regarding this matter can be obtained from SaiSathyaSai.com.